Art history geeks like me often like to ponder some of the conundrums of art history as pertaining to cross-cultural phenomena. The US effectively quashed Native American cultures during the 19th century, even going so far as to send Native children to boarding schools so that they could “learn” how to be “American.” That aberrant policy lasted until the 1930s, but already in the late 19th century there were people in the US who realized the valuable contributions First Nations people could make to American society as a whole. It was at that time that certain groups began to encourage native peoples to produce art in traditional forms (I spoke about this in a previous blog). That leads us to the 21st century, when many aboriginal artists are producing work that reflects traditional themes and symbols in contemporary western media and styles. Two factors led to the production of aboriginal art as a saleable commodity rather than for community or ceremonial purposes: the widespread seizure of First Nations lands and severe reduction in hunting and farming capability, and the late 19th century Arts and Crafts Movement. That movement was a reaction against industrialization and mass-produced “art.” Native art was valued (and romanticized) by non-native patrons as something authentic and sharing in the anti-modernist sentiment. The same assimilationist policies that threatened their cultural survival led to the establishment of “Indian” schools, such as the Studio School in Santa Fe, which taught native artists western materials, styles, and techniques. These factors led in the mid- to late-20th century for the development of a full-scale emergence of a native tradition in contemporary art. The general consciousness of the importance of self-determination that characterized the 1960s may have helped lead to the establishment of the Institute of American Indian Art in Santa Fe in 1962. Native educators incorporated indigenous ways of teaching contemporary art, promoting ideas of individual artistic freedom. Many of the most prominent native modernists of the 1970s and 1980s came from that school. 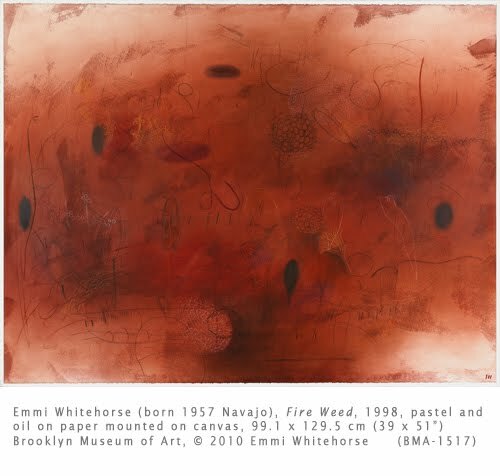 During those decades, many native artists, such as Emmi Whitehorse, developed broader interpretations of Native art to move away from figurative and representational forms. Whitehorse received her MFA from the University of New Mexico in Santa Fe. She has described her paintings as “personal diaries.” They are brilliant abstractions that suggest landscape in the atmospheric washes, and evoke traditional Navajo symbols in the shapes resembling seeds, pods, and roots of plants. Born and raised on the Navajo reservation, she lived with her grandmother and grew up surrounded by Navajo tradition. In Fire Weed, it is obvious that the southwestern landscape is Whitehorse’s inspiration. As a child she collected plants with her grandmother, who hung them on the wall to dry. That is the origin of the floating vegetal forms. Whitehorse’s work is a bridge between the contemporary art world and the world of Navajo tradition. Visit the artist’s website to view Images of other works.